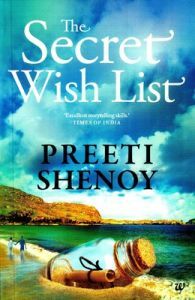 The Secret Wish List revolves around the life of the protagonist Diksha at the time when she was in her teens and a striking disparity in her life 18 years later. At the tender age of 16, Diksha is like just another typical teenager juggling with school, boys, gossip and fun with her best friend until one day when everything changes. An innocent teenage crush invites a string of irreversible events that change her life forever. 18 years later, Diksha who once was a happy-go-lucky and carefree teenager is now a woman with entirely opposite traits. Married to a successful professional and a mother to a young boy, she is a bored housewife wearing the mask of being happily married. An unexpected incident opens up avenues for Diksha to give her life a second chance. and thus, she creates a secret wish list in the hope to fulfill her desires. Will she be able to brave through this journey while dealing with the complexity of an extramarital affair? Will she be able to succeed in the quest for rediscovering herself? The Secret Wish List is about the journey of a woman towards getting her happy life back. It is about her dreams and aspirations and the quest for finding out whether true love exists or not. The Secret Wish List was published by Westland Ltd on 10th December, 2012 and it is available in paperback. Key Features: It is the 4th consecutive bestselling book by the author. The author's flair for expressing human emotions is such that it touches the deepest chords of human hearts. Preeti Shenoy has actively contributed to the Times of India and has also written articles for the Readers' Digest post the tremendous success of her blog. Encouraged by the positive responses towards her publications, she wrote and published her first book 34 Bubblegums and Candies which turned out to be an instant hit. Since then, there was no looking back for her and she authored 4 back-to-back bestselling books.